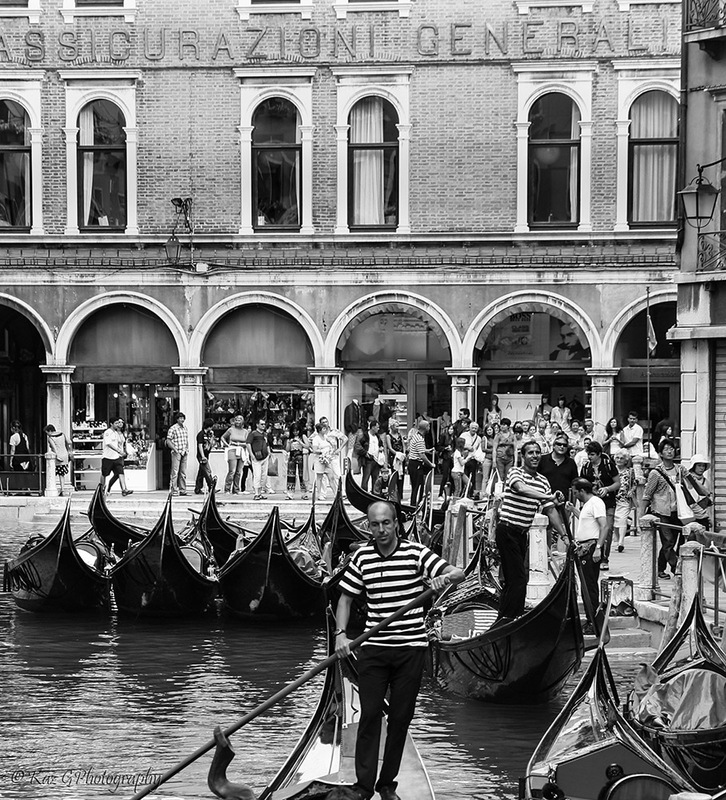 Continuing on from posts on my trip of a lifetime – celebrating my 50th year – we ventured on to Venice for a two night stay. We stayed in a lovely apartment just outside the typical ‘hub’ of Venice in Il Giardini. It was just a reasonable ferryride away from the central area where we arrived by train into Venezia Santa Lucia train station. It felt funny staying in someone’s apartment with all the normal things an apartment holds, that are not yours but if you used your imagination and turned it into a giant positive you could think it was your apartment and this is where you lived, albeit briefly! Venice is so fascinating as there is not another place like it in the world. It is unique. I consider myself a good map reader but even here I find the circular landscape hard to get bearings on and without the signs one could go around and around ALL day! Always somewhere lovely to visit and something new to see each exploration. 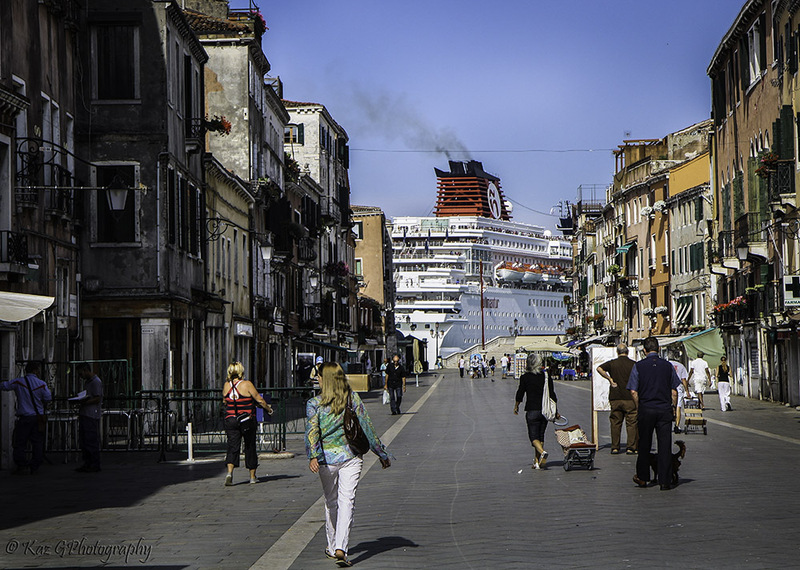 One unusual perspective I had was on walking down one of the streets in Venice with a cruise ship just sailing up the canal ready to dock. It really shows you how gigantic these big boats are as it swallowed up the landscape around it. We had a funny encounter with a postal worker. We wanted to send a lot of our clothing home (our bags weighing a hefty almost 30kg!!!) and he didn’t speak English and we didn’t speak Italian. From his face we could see it wasn’t going to be an easy ride as he handed us paperwork to be filled out. He had resigned himself that it would be a thankless job this one and shook his head as he handed us the forms. Luckily paperwork around the world seems consistent in what information it needs so we marvelled at our understanding and filled out everything asked of us. The man was so impressed with this it gave him renewed vigour and he promptly went about processing our parcels. At the end he shook our hands and shouted “Bravo”, “Perfecto”!! We had won over this man and he was very proud of our accomplishments in the task at hand. We felt we had won the lottery and off our parcels went. Would they make it home??? They did and I have to say Poste Italiane can be recommended highly by this blogger. Although I love the Italians for their hospitality and generosity, there were some shopkeepers (and only in Venice) that judged you simply on your presentation, ie your look, your clothes and your shoes. If you didn’t measure up they simply ignored you until they had to serve you. Of course if we had gone in our best clothes and Italian shoes we may have received faster service. Typically we would get the once up and down look, not even surreptitiously, they made it fairly obvious what they were doing. Of course coming from Australia we went with comfort not style on most treks around the city, ie joggers and shorts with a t-shirt for style! Therefore we didn’t receive a welcome committee on entering most shops. This as I said only occurred in Venice and every other shop in Italy was more than hospitable and welcoming. For related posts please click on Trip of a Lifetime I – Paris, Trip of a Lifetime II – Provence and Trip of a Lifetime II – Lake Como. You still have some very nice shots, and I like your two monochrome images…..
A nice shot is a nice shot but a memory lasts much longer. You have a bit of both here. Thanks for sharing. I love your photos of Venice! I was there years ago and would love to return. Interesting about the shopkeepers!! Lovely photos! I especially like the way you transitioned from black and white to color. Brought back memories for me Karen..really enjoyed your blog and as always loved the photos..